C.C. Sabathia was dominant from the get-go, using a sharp mid-90s fastball (topping out at 96) with his regular complement of off speed to keep the Rays hitless for 7 2/3 innings. When Kelly Shoppach lined a single to left with two outs in the 8th, it was the longest Sabathia had ever gone into a game before giving up a hit. 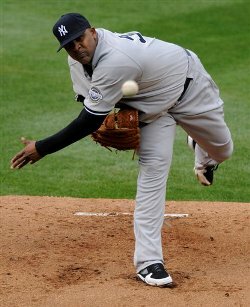 His previous high was on April 7, 2002, when Sabathia kept the Tigers hitless for 7 innings. Randall Simon broke up that no-hitter attempt with a single leading off the 8th inning. C.C. Sabathia had full command as he flirted with a no-hitter in Tampa. Today’s performance was the fourth time in his career that Sabathia pitched at least 7 innings and gave up only one hit. One of those games was a CG shutout of the Pittsburg Pirates while C.C. was with the Brewers. The only base hit occurred on an infield single to the pitcher by Adam LaRoche. The play was very controversial at the time as many felt it should have been scored an error. The last Yankee to throw a no-hitter was David Cone, who actually tossed a perfect game at the Montreal Expos on July 18, 1999. The last Yankee lefty to throw a no-hitter was Jim Abbott, who kept the Cleveland Indians hitless on September 4, 1993. In support of Sabathia’s command performance, the Yankees also flashed some leather. Arod made two spectacular diving plays, one in the first off Evan Longoria and another to end the seventh against BJ Upton. Teixeira also ended an inning with a great play, laying out to snag Jason Bartlett’s liner at the end of the sixth. After going 0-17 to start the season (a new personal record), Mark Teixeira made his first hit of the season count. In the fifth inning, Teixeira doubled into the right field corner, scoring Derek Jeter with the Yankees fourth run of the game. Tex followed up his first knock with two more base hits. Derek Jeter, Nick Swisher and Robinson Cano have now hit safely in all five games played this season. One of Cano’s hits was a two-run blast in the 4th inning. In the early going, he is hitting.380/.391/.714 with 2 HR and 6 RBI. Cano’s hot start bucks a career trend of hitting poorly in March/April. Before this season, Robby’s early season line was a less than stellar .270/.307/.392. Brett Gardner has also gotten off to a hot start (5-13 with 2 BB and 3 SB). With Marcus Thames’ outfield defense being so suspect, Gardner could be playing himself into a genuine everyday role. Curtis Granderson was thrown out at the plate to end the sixth inning. It was a nice throw by Carl Crawford, but the play was made by Kelly Shoppach, who essentially tripped Granderson as he tried to touch the plate and then tagged him as he laid on the floor. This of course, like all blocking of the plate without the ball, is illegal, but for some reason MLB has embraced a tradition that turns baseball into a full contact sport for plays at the plate. Granderson made up for the lost run by lining an RBI single off of left handed Randy Choate in the 8th inning. Granderson has had some rough ABs against lefties, but he has also had some good ones. Francisco Cervelli and Ramiro Pena (pinch ran for Arod in the 9th) both saw game action for the first time all season, leaving Hughes as the only man on the active roster not to appear in a game. Just checked out some of the great infield “D” from today, really impressive! Yanks are looking very solid in all areas so far..and I’m not ready to kill Javy 2010 yet either. Nothing shameful about getting beat up by the Rays, they’re a great team..
wow, 1993 for that Jim Abbot no-no..17 years ago! Remember it well! !